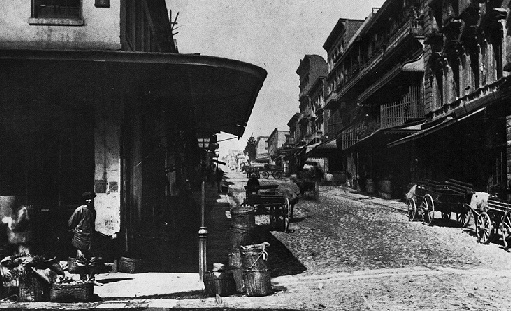 Looking west on Sacramento St. from Dupont Street (now Grant Ave.), c. 1882. At the time Chinatown was only about 6 blocks long. In 1882 the first Chinese exclusion law was passed as the first immigration ban in United States history. Although passed initially as a ten-year ban, the law eventually moved towards total exclusion and Chinese immigrants hoping to improve their lives during a rough period in China were forced to enter the country illegally. When ships with Chinese passengers would arrive in San Francisco, they would be detained in a shed at the Pacific Mail Steamship Company Wharf and forced to live in tiny, cramped spaces. The ban created an era of extreme racial discrimination against Chinese people within the United States as well as a boycott of American goods in China. Initially the 1882 law barred only the entry of Chinese laborers for ten years and left open the question of admission of other classes of Chinese. By 1888, however, the pressure of anti-Chinese groups had shaped its interpretation so as to deny admission to all Chinese except those classes specifically exempted by treaty: officials, merchants, teachers, students, and travelers for curiosity or pleasure. The exclusion act was revised several more times, closing loopholes and becoming stricter in its provisions, and by the turn of the century, the restriction process was consciously and actively moving toward total exclusion. "...upon Chinese persons claiming the right of admission to, or residence within, the United States, to establish such right affirmatively and satisfactorily ... and in every doubtful case the benefit of the doubt shall be given ... to the United States government." Over the years an extremely high percentage of Chinese were denied admittance to the United States. For example, during the fiscal year 1902-1903, inspectors in San Francisco landed 1628 Chinese and debarred 516, and for the fiscal years 1903 through 1905 they rejected one out of every four applicants from the exempt classes.6 To the authorities these statistics served to prove the fraudulent intent of the bulk of the Chinese applying for admission. In 1905 these grievances about immigration procedures resulted in a boycott of American goods which started in Shanghai and spread to Canton and other Chinese cities and many overseas Chinese communities. Sustained several months, the boycott forced the U.S. to relax some of the more objectionable regulations. The basic negative attitude of the immigration authorities toward Chinese immigration, however, remained unchanged,8 and it was against this background of struggle that the Angel Island Immigration Station was proposed and established. Sargent's report of 1903 recommended that funds be appropriated to erect an immigration station on Angel Island for accommodation of aliens, chiefly Chinese and other Asians. The forthcoming decision to move the station to Angel Island was not solely due to humanitarian concern, however, for officials also felt that the island location would effectively prevent Chinese on the outside from communicating with the detainees and would isolate immigrants with "the communicable diseases which ... are peculiarly prevalent among aliens from oriental countries. "11 The station would also be escape-proof.